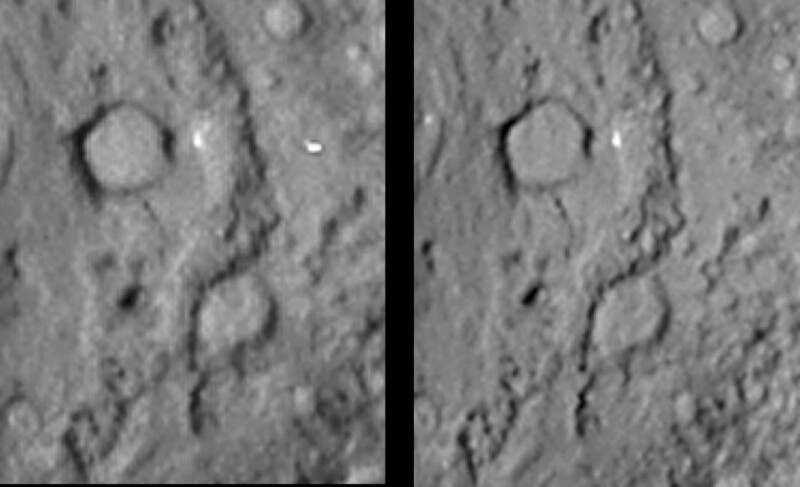 Normal stereo image pair covering the region of the Deep Impact site from the Stardust-NExT mission (left image is meant to be seen by left eye). The diameter of the large crater at the top of the image is about 300 meters (almost 1,000 feet). These images are for viewing with a stereoscope, or for producing a merged 3-D image. Stardust-NExT is a low-cost mission that is expanding the investigation of comet Tempel 1 initiated by NASA's Deep Impact spacecraft. NASA's Jet Propulsion Laboratory, a division of the California Institute of Technology in Pasadena, manages Stardust-NExT for the NASA Science Mission Directorate, Washington, D.C. Joe Veverka of Cornell University, Ithaca, N.Y., is the mission's principal investigator. Lockheed Martin Space Systems, Denver, built the spacecraft and manages day-to-day mission operations.